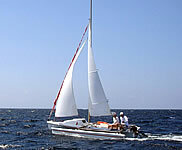 Ex Aqua - Astus Trimarans. Fast, fun and safe, the Astus 16.1 and Astus 20.1 trimarans have been designed to offer maximum pleasure with minimum hassle. Their folding floats give you access to narrow slipways and monohull berths in marinas and their light weight make them towable even by a small car. 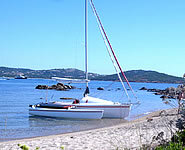 They are friendly boats that you will want to take to your favourite sailing spots all year long. 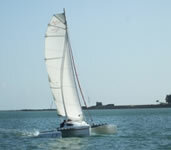 Ex Aqua is also pleased to announce the launch of the Astus 14.1 trimaran, the latest addition to the Astus range. The Astus 14.1 completes the Astus range of trimarans from the entry level, alongside the Astus 16.1 dayboat and Astus 20.1 cruiser. On the water the personality of these lovely trimarans really shows: their high sail area over weight ratio will give you endless exhilarating sailing, with their multihull design and high-buoyancy floats and hull keeping them safe and easy to handle. For those who have been hesitating between a racing dinghy and a catamaran, the Astus 14.1 trimaran comes as an exciting alternative. The Astus 14.1 combines the ease of handling and steering of a monohull with the speed of a catamaran. 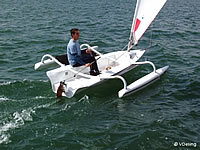 The flared hull and large cockpit provide a dry and comfortable sitting position whilst the floats provide reassuring stability. Each sponson, with 80 litres of buoyancy, provides the same righting moment as an adult on a trapeze. 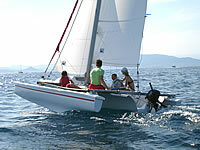 This allows the boat to carry more sail on a narrow planing hull and achieve planing speeds more quickly. 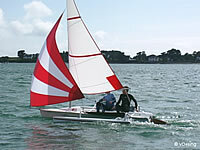 Beginners will enjoy a boat capable of picking up speed in light wind whilst being stable and easy to control. Experienced sailors will enjoy planing sensations similar to a skiff but with a much shorter learning curve, thanks the Astus 14.1's ease of use and furling gennaker. The first trials of the new Astus 14.1 trimaran took place on June 30th in Brittany and we were delighted to find that the boat fully lives up to expectations. 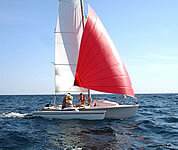 The boat is fast and nimble and can easily take two adults on board or be sailed single handed. The Astus 16.1 trimaran was born from the desire to create a family-friendly dayboat offering maximum pleasure with minimum hassle. Its simplicity makes it accessible to novice sailors whilst its high sail area over weight ratio (17.2m² for 240kg) will get even the most experienced sailors excited. The multihull design enables the Astus 16.1 to achieve greater speeds than a monohull effortlessly, increasing the range of places you can reach within a day. 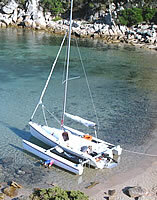 Thanks to its simplicity and versatility you will want to take it to your favourite sailing spots all year long. Fast, fun and safe, the Astus 20.1 is a friendly trimaran that was designed to offer you, your family and friends endless exhilarating sailing. With its inherent stability, shallow draught, vast cabin and ample storage capacity, the Astus 20.1 is the ideal partner for sail-camping trips - the vast cockpit and comfy trampolines offer plenty of extra sleeping space with ad hoc tents. The multihull design enables the Astus 20.1 to achieve much greater speeds than a monohull, increasing the range of places you can reach within a day. A new approach to cruising. With half the weight and twice the speed of a monohull cruiser of the same size, the Astus 22.1 brings fresh air to the world of small cruisers. Light, nimble and fast, the Astus 22.1 can take you within a day to destinations that were until now out of reach. More of everything. The Astus 22.1 takes the design of the Astus trimarans further: more speed, more space, and more versatility. 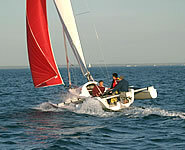 With 28 square metres of sail area, it reaches high speeds effortlessly even in light winds. The large cockpit (1.8 metre wide) provides ample space for 8 adults, with vast trampolines providing another 8 square metres of sunbathing space. The vast cabin offers four berths and ample storage and sitting space. Sail effortlessly in total confidence. Higher speeds do not come at the expense of stability or ease of handling. The Astus 22.1 floats, 4.6 metres apart with 850 litres of buoyancy each, provide reassuring stability even in harsh weather conditions. Furthermore, the Astus 22.1 has blocks of polystyrene foam built in the hull to make it unsinkable. Accomodation. The Astus 22.1 offers surprisingly vast accomodation for a trimaran of this size. The twin centreboards free the cabin floor, providing easy access to the four berths and galley area and ample dining space for five people. Easy to live with. The Astus 22.1 is easy to live with: easy to move around and tow due to its light weight, easy to launch and recover due to its telescopic float mounts and singlehanded mast stepping kit. At just 2.53m wide with the floats retracted, the Astus 22.1 can be towed by a medium-sized family car, opening the way to an unlimited variety of sailing grounds. Ex Aqua will be attending the South Wales Boat Show held at Margam Park, Port Talbot, South Wales.